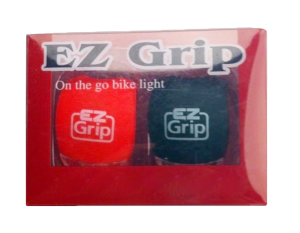 LumenX Ez Grip Bike Light consists of a front bike light and a rear tail light which can fit and can easily attach to any bike – mountain bike, street bike or children’s bike. It has a high quality silicone material and a water resistant property which makes it great for safety and emergencies. These LumenX EZ Grip Bike Lights are great! I am definitely not the handiest of people, but these lights were so quick and easy to install that anyone can do it, including me! It literally only took me a few seconds to install both lights. You don't need any tools at all, they just clip right on and fits any bike! You get two, one for the front and one for the back. I love that they have 4 different modes (blinking options) you can choose from... Constant, Strobe, Disco Strobe and Epileptic Fit Strobe. The front light shines white and the rear light shines red. These are small but powerful. They shine really bright, making you easier to see by other motorist and that's always a plus! I definitely feel a lot safer with them on my bike. I will definitely recommend these for anyone who owns a bike, no matter your age... You really can't go wrong! 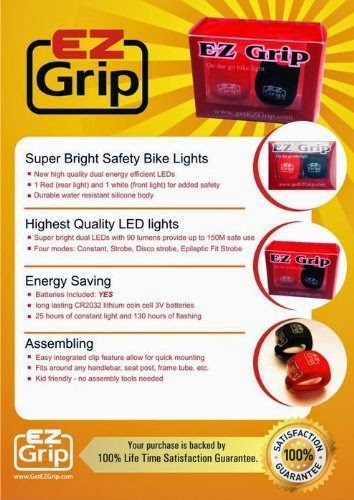 If you would like to try it out for yourself, you can purchase the LumenX EZ Grip Bike Light right now from Amazon!